TV5's resident legal analyst Atty. Mel Sta. 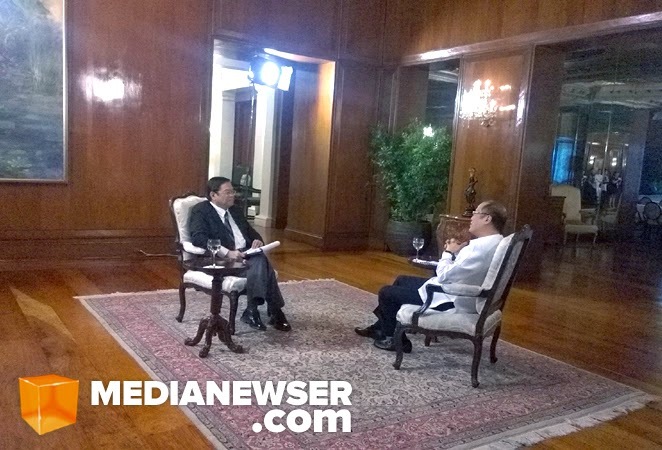 Maria was able to score an exclusive interview with President Noynoy Aquino on Wednesday — his first big interview since joining the Kapatid Network three years ago. In the interview, the president said he is now open for the amendment of the Constitution, with a possibility of seeking a second term come 2016. “Nung pinasukan ko ito, ang tanda ko one term of six years. Ngayon, after having said that, siyempre ang mga boss ko, kelangan kong pakinggan ’yon,” PNoy said. When asked about his experience interviewing PNoy for the first time, Sta. Maria said it was a privilege to have been the one chosen to interview the president on a one-on-one basis. "I hope the Filipino people will watch the interview. I am sure they will learn a lot about the issues confronting the nation." He added, "Also, I know the people will get an insight of the personality of the president. From up-close, he speaks very intelligently and with reasons. He knows the issues and is able to articulate his opinions clearly." The interview will air this Sunday, August 17 at 10PM on TV5.